History Camp Boston 2019 will take place on Saturday, March 16, 2019 at Suffolk University Law School, across from the Old Granary Burying Ground in downtown Boston. There will also be events that evening and on Sunday, so save both Saturday and Sunday, plus travel days for those coming from other regions. Sign up to be notified of updates, including when registration opens. If you are interested in presenting, send me your draft title and description, following the form we’ve used in prior years. If you’ve not attended a History Camp before and would like to get an idea of what you can expect, this is a good introduction. You may also browse 2018 and 2017 (and other years), with photos, session descriptions, the schedule, and presentations. Complete details, including the growing list of sessions is at HistoryCamp.org/Boston. Our thanks to Bob Allison and all of the folks at Suffolk who are making their beautiful facility available again next year. 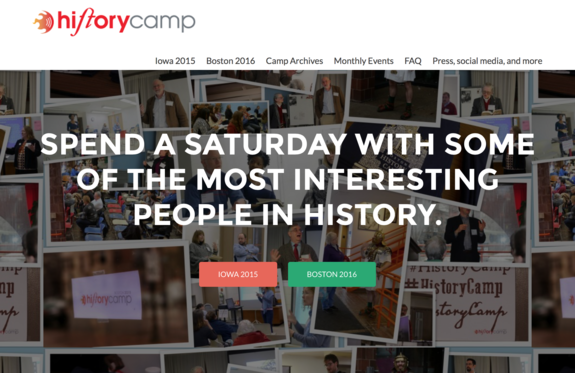 Complete information on History Camp Boston 2019, including the list of presentations, is on the History Camp Boston page. History Camp Boston 2019 is in downtown Boston, near the Park Street Station on the Red and Green lines. For those driving, there are parking garages nearby. Alternatively you can park at an outlying station (such as Alewife, where parking is $7 for the day) and take the T in. More information is on the directions and transportation page.